This year was a big one for me in terms of tennis. It was my first official year on varsity, I played doubles for the first time ever (I had been playing singles my whole life) and on Saturday, we won state. These past few months have been the most rewarding and exciting of my life and I wouldn't trade the time I spent with my team for anything. 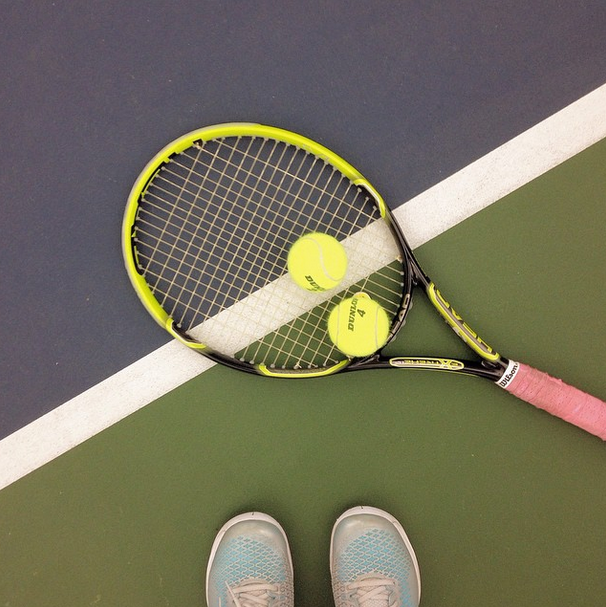 I often get a lot of questions about tennis and high sports in general, so I thought it was the perfect time to dedicate a post to what I've learned throughout the season! I quickly learned that if I wasn't going to put in the time to practice, then I wouldn't get better as a player when it came to my skill or closeness with the team. You really have to take advantage of free weekends and weeknights to practice, and even asking a player or two to go hit can be incredibly helpful. On weeks that I knew I had more than 2 matches, I would do as much homework as I could ahead of time. This meant completing projects early, studying in advance for tests and doing any kinds of readings or packets the weekend before. That way, you aren't stressed out throughout the week and can focus on your matches ahead as well as finish up your homework. You aren't always going to get along with everyone. There is always a person or two you don't get along, and sometimes no matter how hard you try, it just doesn't end up how you want it to. If you ever have problems with a certain player, it is important to try to work things out as early as possible, even if it means talking to your captains or coach about it too. Spirit wear can really help you unite as a team. As crazy as this sounds, investing in a piece or two of spirit wear that everyone on your team has is really beneficial to get closer the other players. We ordered cute sweatshirts that we all loved, so we would wear them on spirit days at school, to matches and eventually to state together. It may sound materialistic, but often wearing matching clothes can be the cherry on top of a united team. Always keep your main goal in mind. Last year our team lost by 1 match at state, so when we realized we would have to play them again this year, we all kept that in mind throughout the season. Whenever I thought about skipping an optional practice or staying home when I felt a little sick, I would think to myself: "If we end up losing state, will I regret not getting in a little more practice time?". When you keep your main priority in mind over the course of the season, it really makes it a lot easier to accomplish that goal. And guess what? We ended up beating that team this year! I hope this post was helpful for you guys and is able to be applied to any sport! I'm curious to know: what sport do you play? Oh I love when we get spirit wear for my golf team! You're right, it really does unite everyone. Great post on high school sports Caroline! Congrats on winning state! You are so right about getting out what you put in. I ran cross country in high school and extra miles (or hitting) can really make a difference. congratulations on states!! I also played tennis in high school and really agree that it takes up a lot of time, but is totally worth it in the end! love love love this post! it's so relatable because I'm on the track team and when I put in the time to get better, I ended up increasing my 100 meters by 3 seconds! Congrats on states as well!